Looking at our most resent family reunion keepsake booklet it is commendable that we've enjoyed over 40 years of fun and inspiring family reunion events. I would have to say that commitment to strong family values is the key. If you're like me you want each family reunion occasion to be the most memorable for everyone involved. Whether your reunion is just around the corner or several weeks away there are ways you can put an indelible mark on the memory of your next family reunion event. 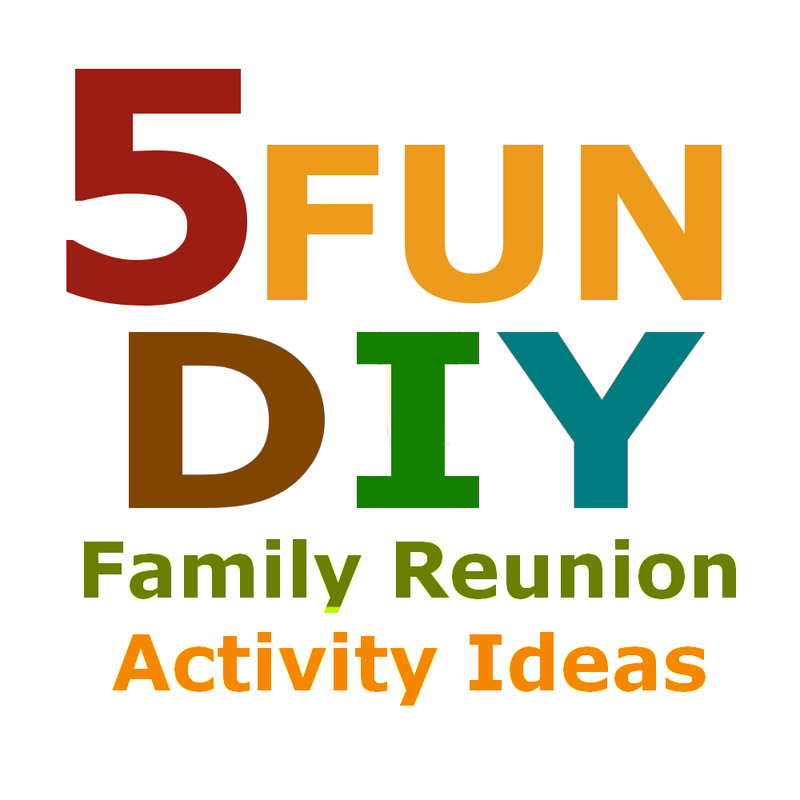 Here are 5 fun DIY family reunion activity ideas that won't break the bank. This Months Events: So you've planned some activities but still need last minute activity ideas.Something that the children will consider outstanding, fun and memorable. Nothing comes close to these three exciting activities. 2. Bubble Show - Performing Arts with Giant SUV Size Soap Bubbles! For more details on these activities consult your family reunion planner web app. Future Events: If your event is months away consider planning a family talent show right now. Talent shows rank high on the most popular family reunion activities list and certainly the most entertaining. The fun part of planning a talent show is the auditions. Take video of each audition and make it a feature of the show. The laughs and awe are unending. Select clean comedy, well rehearsed music recitals, good singing, cute clown or gymnastics acts, professional puppet shows and other engaging performances. Tip: Most families have at least one performing arts professional. Include them. Call the talent show something like, "The Smiths Got Talent!" Past Events: We suggest sending attendees a newsletter sharing the highlights of your event. The newsletter maker is readily available along with the keepsake reunion booklet maker, genealogy presentation worksheets, a welcome package and so much more using Fimark's Family Reunion Planner Social web app. Quick planner access provided at the bottom of the page. Need more funds for your family reunion? There are a number of ways to raise funds. Much has to do with the kind of event you're planning. We'll discuss some of the more popular fundraising ideas in this article. But first let's talk about promoting the event. To raise funds for your event you need the support of key players who will help you plan, organize and manage the event. 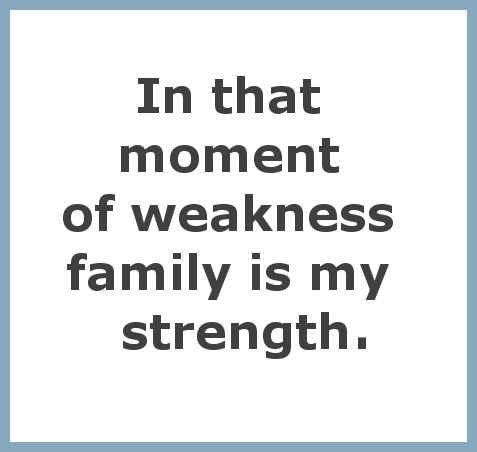 Consider family members with exceptionally good social and communication skills. The best way to go about soliciting support is to feed your potential volunteers, and feed them well. That's right, invite them over and feed them a light lunch complete with a yummy dessert. About midway thru the course while you are pouring drinks ask them for fund raising ideas. Find out what they have done to raise funds for other charitable events. Next warmly ask for their support. Next you'll to promote your fundraiser. Get the youth and young at heart involved in the process as soon as possible. Tell them what you want to accomplish and get their ideas on how they plan to pull it off. They'll offer loads of them just brain storming. Get all the ideas down in writing. Make sure your ideas for event activities center around the interests of family members, especially those most prominent and most loved. Get the fun and active family members involved. Give them specific assignments that are in their area of expertise. 1. Have some draw up and mail fundraiser invitational flyers. 3. Have others call older family members and arrange for transportation to the event. A great way to raise funds is by way of selling memorabilia and keepsake items like t-shirts, caps, visors, aprons and hand bags. Once you decide on a theme and slogan for the event it's time to begin designing the art for t-shirts and other keepsake items. Fimark's Family Reunion Planner web app showcases pre-designed event theme art on t-shirts, caps, visors, aprons and hand bags via Zazzle.com. The interface allows you to price and sell these items and more online. Another fun idea is to hold an online fundraiser from your family reunion website. Fimark's Family Reunion Planner web app guides you through the process. Just open a family reunion website account, select the fundraiser form and you're up and running in minutes. Send a link to all your event invitees with periodic updates featuring those who contributed. You might even offer a prize to persons donating $50 or more. Example: Win a free Family Reunion Keepsake Book filled with family reunion recipes, family history charts and a journal and genealogy section. You can also even sell tickets to the reunion event. The family reunion website is enabled with an event ticket sales feature. If you're going to sell tickets to the event you'll want the entertainment to be above standard. How? Have talented family members? Treat your family reunion like a concert. Invite talented entertainers, artists and craft person to showcase their skills at the family reunion talent show. Have the event catered and hire a highly recommended event decorator and band. Many of these services are a part of the package when renting out a reception hall. If you want to keep the reunion event simple another way to raise funds is a book and bake sale. Find out what desserts, books, music and DVD's your family members like most. Create a list of deserts and books, music CDs and DVD titles family members like. Send the list to all family members asking for title and baked goods donations. Next invite all family members to a local book and bake sale and use the proceeds to fund the family reunion event. The company is MyEvent.com. They boast having helped raise over $25,000,000 and is the only company that allows individuals to accept donations online and sell tickets without a merchant account on a complimentary fundraising web page that has no ads and hundreds of design themes to choose from. 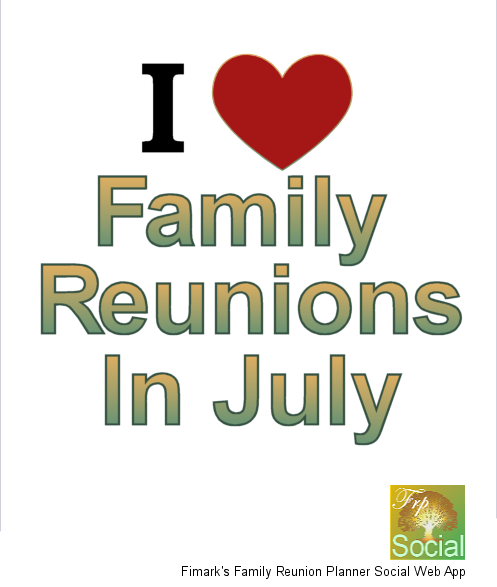 Planning a family reunion in July? You still have time to pull it off. Here are some simple steps to get that event planned, organized, off and running. 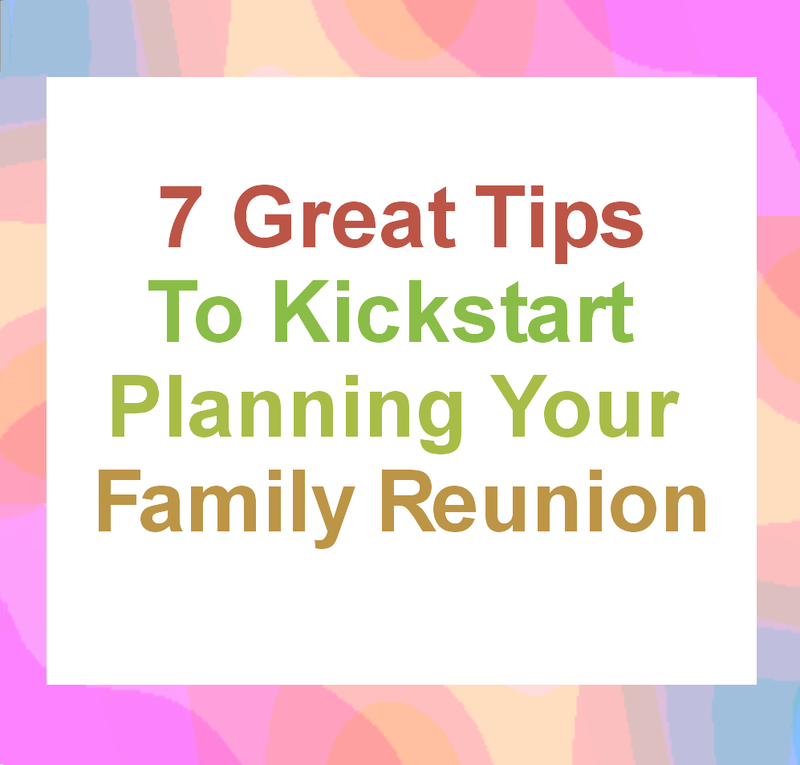 First off, avoid being the sole reunion planner. I suggest your start forming a family reunion committee of three or more members. Consider those who you are particularly fond of and are almost certain will attend the event. Elect those who have some experience throwing parties, have successfully planned several events, are computer literate and enjoy all things arts and crafts. A family member who has spent some time as a travel agent or tour guide along the east coast would also be most helpful as a travel adviser. Since most of your family don't have children and are at or coming close to retirement age a few should have some time on they're hands. The more help the better. Regarding Invitations: How your invitations look is not nearly as important as the content. People need to know what they can look forward to at the event. Who will be attending. The activities and entertainment featured. Using a survey find out what the majority enjoy doing. Consider their interests, talents, skills and education. Popular Reunion Activities: Most families a thrilled when when one of the activities involves a talent show. Others would love putting their arts and crafts creations display. Avid book readers would love to meet published authors in the family. Music lovers would enjoy poetry and piano recitals. Food lovers would enjoy Emeral style cooking and wine tasting demonstrations complete with jokes and live band. Some stand-up comedy in good taste is a great crowd pleaser. 1. Form a family reunion planning committee of talented event planning enthusiasts. 2. Send out an initial survey regarding themes, venue locations and activities. 3. Consult your East Coast travel advisers for the best venues. 4. Collect survey results and vote on theme, activities and location. 5. Rally support and spur enthusiasm by promoting popular entertaining reunion activities everyone will enjoy. 6. Hold online talent hunt contests using Youtube, Skype or Google Hangouts. 7. Send invitations via email. Most folks have one. Send the rest via post mail. If you're looking for more ideas, templates and worksheets for surveys, committee meetings, to create your family tree, printable invitations and family reunion keepsake booklet designer consult Fimark's Family Reunion Planner Social web app at www.fimark.net. Here are two fun weekend projects for your next family reunion event. Crafting family reunion party favors. Get together with the whole family and pour tall cold glasses of iced tea or lemonade and lets get started. These two creative projects includes transforming an ordinary household item into a decorative family keepsake perfect for the picnic table or banquet dinner by making event logo labels for small spring water bottles or soap bubble bottles the kids will enjoy. You'll find great bargains on mini spring water bottles and soap bubble bottles at your local dollar store or order them in bulk online and save even more. For both projects download the family reunion logo used for your reunion T-shirts. Have at the ready your family reunion theme and slogan. For theme and slogan ideas consult Fimark's Family Reunion Planner Social web app. edge of the of the paper including the white space. 1. Print the craft template listed above on colorful card stock paper. 3. Punch a hole in the corner of each square. Enjoy other fun family reunion party favor crafts when you access Fimark's Family Reunion Planner Social web app. It's event planning at it's personal best. The 132 page personalized family reunion event planning guide with signature poetic excerpts, a reunion planners journal, recipe compiler and genealogy worksheets. Set your course and take a remarkable journey planning your family reunion. 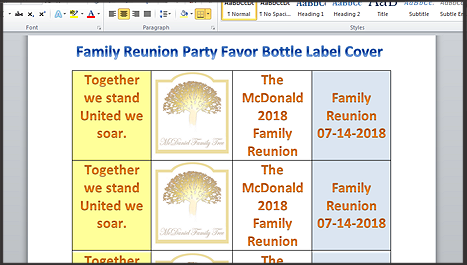 Get the Family Reunion Planner Guide and Keepsake in PDF or Word Doc format when you access Fimark's Family Reunion Planner Social web app.